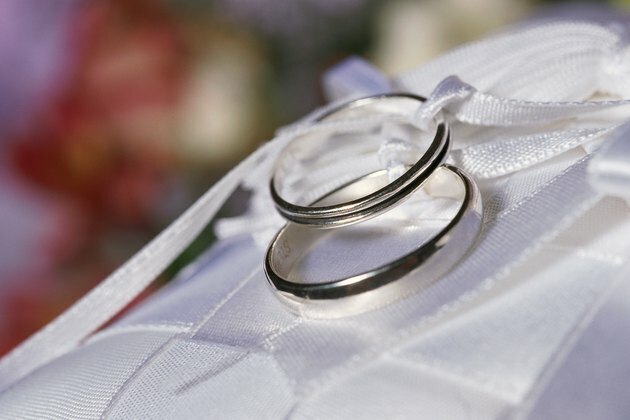 The earliest wedding bands are believed to have originated in ancient Egyptian times. Egyptian women were given papyrus reeds woven into circular rings that represented the betrothed's never-ending love. During Ancient Roman times, men gave women valuable rings made from silver or gold to represent the trust they placed in their wives. Today, silver and gold are still a common choice for wedding bands. Understanding the unique pros and cons of each precious metal can help decide which is right for you. Silver is one of the brightest and most brilliant white metals. Pure silver and pure gold are both extremely soft metals, which are alloyed with other metals to make them durable enough for use in jewelry. Silver is usually hardened by mixing it with a small amount of copper. Jewelry that bears the 0.925 sterling silver label must contain at least 92.5-percent pure silver. White gold is actually yellow gold mixed with white alloys such as nickel, zinc and palladium; as a result, it is not as bright as silver. Rhodium plating is often added to brighten the appearance of white gold jewelry. Gold purity is stated in terms of its karatage. Unlike yellow gold, white gold is only available up to 21 karats; any higher and the gold would be yellow in color. White gold labeled as 18k is 75-percent pure, and 14k white gold is 58.5-percent pure. White gold is also sometimes available in 10k, which is 41.7-percent pure. Silver is one of the most economically priced metals, while white gold is often perceived as a lower-cost alternative to platinum. Both silver and gold prices should be expected to fluctuate according to current market conditions. Although silver is generally less expensive than gold, other factors such as the craftsmanship of the ring, and the use of diamonds or other gemstones can drive up the costs substantially. Silver scratches easily, which can detract from the appeal of a silver wedding band. Thinner silver rings are susceptible to bending and losing their shape, and may not be durable enough for daily wear. White gold in the 18K range or lower is often more durable than yellow gold in the same karatage, which makes it well-suited for daily wear. A professional jeweler can repair most scratches and damage to a sterling silver or gold wedding band. Sterling silver is notorious for its tendency to oxidize and turn black, or tarnish; but with proper care and cleaning, the metal can be returned to its original brilliance. Many jewelry stores also offer tarnish-resistant sterling silver, which has been treated to prevent oxidization. White gold may appear to yellow as the rhodium plating wears off. As a result, the plating will need to be replaced periodically to maintain the jewelry’s bright shine. Silver conducts heat and electricity extremely well, and is not a good choice for anyone who works under high-heat conditions or around electricity. White gold is often alloyed with nickel that causes allergic reactions in some people, but many jewelers carry gold alloyed with hypoallergenic metals. What Causes Skin Discoloration From Gold? Can Gold Be Harmful to the Human Body?